IF YOU COULD MEET AND DRAW A PORTRAIT OF SOMEONE FROM HULL’S RECENT PAST, WHO WOULD THAT BE? Having produced LIL the Play, it would have to be Lillian Bilocca for me! 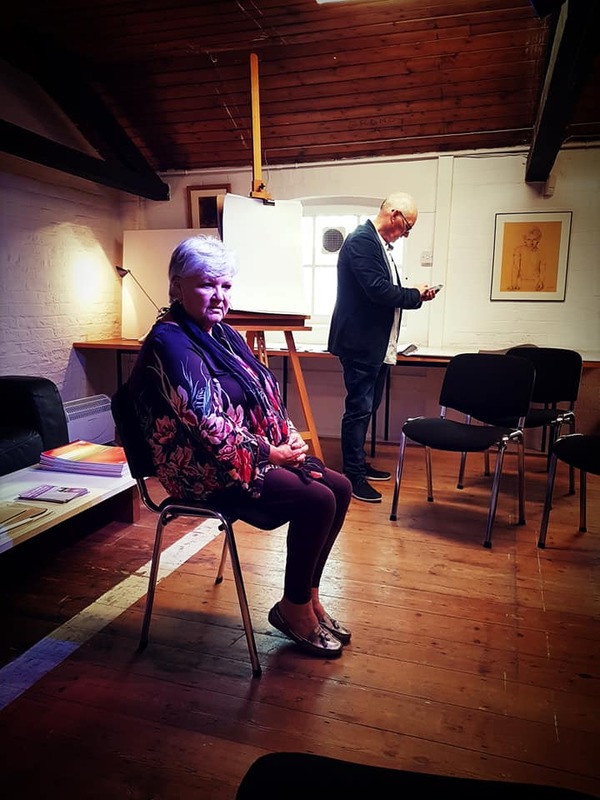 Jean Shakesby (who was on the original silent march with LIL) and Sue Thompson both sat in the Portrait chair and the rest put pencil to paper. I gave an introductory lesson on how to draw the human head and face. The laughter and banter between the LASSES is always pretty good, but on that day it was off the chart. I thought art was supposed to be serious? Not any more. I think I’ve found a formula that most people will feel at ease with. Some of the other LIL’S LASSES want to book a session now. Jean and Allison will also be coming back to my studio for a Solo sitting with me where I will be drawing their individual portraits with headscarfs on, as part of a project featuring local people called PAD PORTRAITS (a project I’m really excited about, which I’ll tell you about some other time). So who would you like to draw a portrait of today? Why not your Mam or Dad? A friend? or another local hero? I guarantee if you do, it beats a photo for looking back at with fond memories of the time you spent doing it. Can’t draw? Worried about the end result? Forget it! Unless you’re planning on selling it to Sotheby’s, it’s about your practice not making someone else happy. It’s really about enjoying the moment and the time spent with the sitter. I’ll give you the knowledge to approach a portrait drawing session with confidence by teaching you the simple techniques to help you. For you to practice over time. Drawing is something you can savour and have fun with all your life. 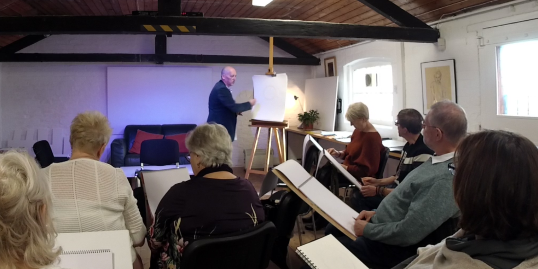 As well as booking in workshops for groups, I have also added a Saturday morning Portrait Drawing Lesson, where those who want to can go deeper each week with their portrait studies. IF YOU’RE INTERESTED TO FIND OUT MORE ABOUT BOOKING A GROUP PORTRAIT WORKSHOP WITH YOUR FRIENDS OR WORK COLLEAGUES? (OR KNOW SOMEONE WHO MIGHT BE) – CLICK HERE. I look forward to meeting and drawing with you!